Jiddu Krishnamurti’s writings when I was 17 years old. Later, I carried a copy of “Flight of the Eagle” in my back pocket for years, underlining passage after passage, not quite understanding what I was reading but drawn into it. JK writes about seeing the real versus chasing after the ideal. When you see the reality of the craving, clinging, selfish ego with all its selfish habits (including spiritual seeking) – if you stay with it, really look at it – then something else arises “darkly” (mysteriously). The mind seems to only separate. The “inward-turning mind” (Shinran) is the ego, the separator, the ideal-seeker. 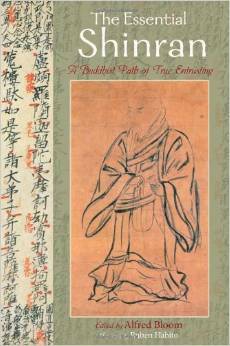 In one translation at least, the Shin Shin Ming offers what I consider to be a nembutsu teaching. It says (something like) when you see delusion arising, simply say “not two”. That was my nembutsu for years prior to my discovery of Shinran. When I caught myself liking/disliking, loving/loathing/, craving/hating-and seeking something inside me said, or remembered, “not two”. The contraction, the suffering, is my teacher. There is a simultaneous recognition of suffering and its release in “one thought moment” (if I may borrow that phrase). And so, for me, the “devil” is my teacher, the poison is the cure, the glitch is the key. My own primal, ignorant gut-crunch, when recognized, is actually “the name that calls”! Prior to hearing this call my only response to this “mechanism of suffering” (to quote non-duality teacher John Wheeler) was to seek an escape from it, to kill it somehow, extinguish it through my own efforts. But my efforts were a part of that mechanism of suffering, and so inevitably my efforts to escape made things worse. How desperate I was! A silly pun “came to me” and I felt a kind of grace. And when I say grace, I don’t mean that theistically. I just mean grace as a poetic descriptive word for the indescribable (call it Amida, call it Samantabhadra, just don’t call it supernatural!). That wasn’t the first time I felt that grace – which is my home, despite myself. It just clicked then, like my blinkers as I was ready to make a turn. As it clicks now when I see this “self”-created primal contraction. Then something happens “darkly”: I am embraced by true reality. I find the nembutsu in Zen/Ch’an, in Dzogchen, in Advaita, in the great sage Nisargadatta (his phrase “I am That”, to me, is the same as namu amida butsu). I find it everywhere, because I find my self-seeking everywhere. Must I condemn myself? Must I damn myself for constantly clutching and grasping and hating? I can’t get rid of myself. I want constant bliss (pleasure). Where is it? I don’t’ want what I have, I don’t want to be where I am, I don’t want to be who I am. If I keep seeking, will I find paradise? My sole occupation is to drive myself crazy. Yet, somehow, I’m hearing something else. What is that? The truth about all this nonsense is seeping through. Is that the name that calls? Is my craziness itself somehow the gift? I don’t agree with what is said here. I love your sentiment but mixing everything like this is not useful. The Other Power school is absolutely separate from the self-power methods. Nembutsu is not Zen, is not Dzogchen, is not Advaita. In fact, it’s the exact opposite. In Shin, a feeling of dualism is required, while in Advaita, it has to be denied. Thank you for your comment. I am definitely mixing things up! But it seems to me that the nembutsu is a perfect expression of nonduality. An overview of Shinran's life and legacy followed by more than 300 passages from the biographical literature and Shinshu doctrinal works, with the author's notes. Available in softcover and Kindle editions from Amazon.